The movie was a success at the box office. According to Variety, the movie could have been title The Long Green Line, because of the dollars brought in. The movie was filmed in Cinemascope, done so reluctantly by John Ford, the director, who was uncomfortable with the process but who used it skillfully nonetheless. The movie was based upon Bringing Up the Brass, which was written by Marty Maher (the character Ty played in the film). John Wayne, a favorite of John Ford, was originally chosen for the lead male role. Because he was unavailable, Maureen O'Hara, who was Ty's leading lady in The Black Swan and had wanted to do another film with him, by a clever presentation to Ford, got him to offer the role to Tyrone Power. According to Maureen O'Hara, John Ford was especially hard on the actors in the movie, including herself and Tyrone. She came close to quitting, but hated to do so because of her regard for Ty. She remarked that he tried to embarrass Ty in front of the cast and crew when Ty suggested to Ford that a pipe would be a useful tool for aging his character. Ford reportedly called him a "thinking actor", expressed in a sarcastic manner. However, Ty did manage to work well with him, and he later narrated the film, Rising of the Moon, for Ford, who had learned to respect Ty and his work. The movie was a mix of serious drama, as well as light comedy, and Ty showed his ability to act in either equally well. President Dwight D. Eisenhower wrote the following in his foreword for the book: "I cannot put too high an estimate on the help [Maher] gave my morale. Marty, with his Irish wit and his talent for understanding, did the same for many, many others." President Eisenhower, class of 1915, very much approved of the movie. He personally agreed to having actor Harry Carey Jr. play him as a cadet in the movie. Director John Ford took shots of the corps on parade for various scenes in the film. He adjusted his shooting schedule in order to simply catch the corps on parade, as the cadet's routines could not be disrupted for the film. There have been a number of movies with West Point as the backdrop, including 1924's Classmates, 1934's Flirtation Walk (in which Ty appeared in a non-speaking uncredited role), 1942's Ten Gentlemen from West Point, and 1950's West Point Story, among others. 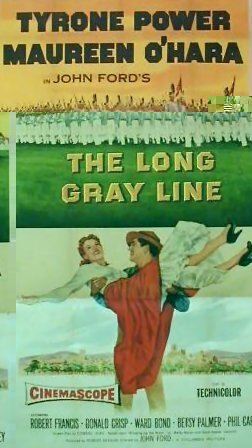 It is commonly agreed that The Long Gray Line is the best of these movies. In 1942 Ty turned down another West Point movie, which co-starred Maureen O'Hara, called Ten Gentlemen from West Point. Instead, he took the role of Clive Briggs in This Above All. Later that year, he and the wonderful Maureen O'Hara got the opportunity to appear together in The Black Swan. The character that Ty played in the movie, Marty Maher, who died at the age of 84 on January 17, 1961, is buried in the West Point cemetery.